Are drone intelligent swarms the future of drone application? Colorado researchers are working on it reports Renee Knight for Inside Unmanned Systems. Like teams of people, much more ground can be covered when multiple drones work together. But for that to happen, they must be able to communicate with each other and make decisions based on the team’s overall goal—technology that researchers at the University of Colorado Boulder have been working on developing for years. Their system combines a robust wireless communication network, an operational interface that gives the pilot the situational awareness needed to monitor multiple aircraft, and a specialized autonomous algorithm that enables the drones to make local decisions and then communicate them either directly to each other or to a centralized ground station that distributes the information. Eric Frew, associate professor of Aerospace Engineering Sciences is the project lead. 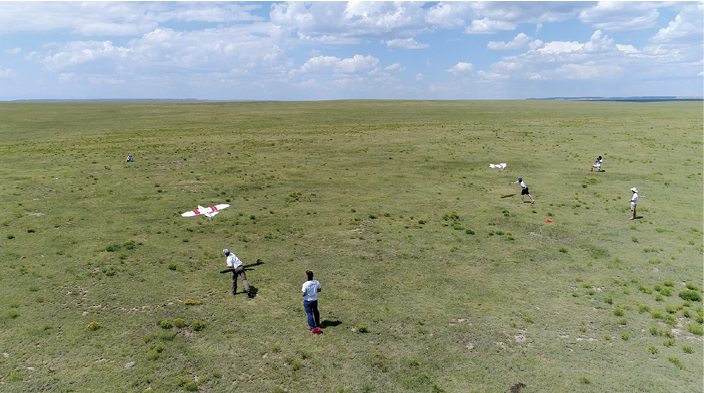 Frew and his team tested advanced drone swarming technology at the Pawnee National Grassland near Greeley, Colorado. This type of swarming technology can be used for a variety of applications such as finding lost hikers and skiers, tracking wildlife more safely and more economically, and predicting severe storms, such as intense tornados. The fact multiple drones can work together to quickly cover more ground is a significant benefit that drone swarms offer—especially in search and rescue situations—but there are other reasons to consider deploying swarms. Swarms are more robust against a single failure, for example, so if one sensor stops working or one of the collaborating drones is somehow damaged, there’s a good chance the operator will be able to complete the mission with the remaining drones. Another benefit is cost savings. Three or four $1,000 drones flown together might have the same capabilities as a 5,000 or $10,000 drone.